Benefiting from the mobile application as a platform of highly convenience, our APP will timely present rich information about various types of sales and lots through in-depth exploration of upcoming sales, selected lots as well as rules of buying and selling to clients, thus delivering them an experience that combines art and life closely. Following glorious history of Xiling Yinshe, we dedicates ourselves to preservation and promotion of traditional Chinese culture. Bearing authenticity and transparency as its priority, Xiling Yinshe Auction annually offers spring and autumn auctions as well as special sales that make breakthroughs, among which Chinese painting and calligraphy, seals, ink stones and objects of vertu being the most notable and manuscripts and letters by celebrities, fine ancient books & rubbings, Zisha works of art, stone carvings, bricks of imperial palaces, Chinese coins and paper money, oil painting & sculpture, comics and illustrations, jade carvings by contemporary artists and famous Chinese wine are included as well. 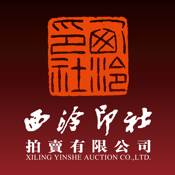 In that light, Xiling Auction is constantly devoted to exploring categories, evidenced by the introduction of more than ten ground-breaking sales in China which are highly recognized on the market.